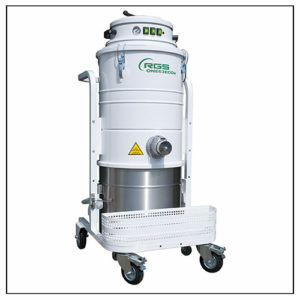 This model has been designed specifically for cleaning ovens and the areas of bakery and pastry. Making thanks to the experience gained in recent years with the sale of more than a hundred systems, installed in the bakeries of the supermarkets. The result is a machine capable of simultaneously guarantying the effectiveness of cleaning characteristic of the Industrial Vacuum Cleaners R.G.S. and the safety of use in potentially dangerous conditions, such as the internal cleaning of bakery ovens which may even reach 250 °C. This safety is guaranteed by the use of two filtering systems in series (a star filter for HIGH TEMPERATURE and another ABSOLUTE filter) additionally the whole system is in electrical equipotentiality. A temperature probe installed in the machine stops suction if the temperature becomes too high. Thanks to the use of three single-phase independent motors the machine provides great flexibility of use with a very low cost.